Dionysus (also called Bacchus) was the Greek god of wine, festivity, and pleasure. A son of Zeus and Semele, he was known to be riotous and mischievous. One day a mortal angered him by refusing to participate in one of his festivities. Dionysus vowed to take revenge upon all mortals who rejected his gifts of wine. He targeted a young woman who was on her way to pay homage to the goddess Diana, by unleashing two great tigers to devour her while he watched. Diana, however, rapidly turned the girl into a pillar of gleaming white quartz to protect her. Dionysus, realizing what he had been about to do, began to weep. As his tears dripped into his goblet of wine, he dropped it and it spilled onto the quartz pillar, staining it a deep purple. According to Greek legend, the stone was named Amethyst, for that was the name of girl who had been turned to purple quartz. In Greek, the word “methy” means wine and “methystos” means intoxicated. Thus “amethystus” means “anti-methystos” or “not intoxicated” (sober). The ancient Greeks believed that if they drank wine from goblets encrusted with amethyst, they could drink all they wanted and the gem would prevent them from ever becoming intoxicated. Today we know that amethyst is produced when iron impurities present in quartz become oxidized. In fact, if heated beyond a certain point, amethyst will lose its purple color, and turn into the mineral citrine, which is yellow or brownish-red. Amethyst is the most precious of all quartz minerals and ranges in color from a light lavender or lilac to violet and deep purple. It has been found in veins that can be up to several meters long; but, amethyst of the quality used for jewelry is actually very rare. Amethyst is produced in several countries, but the world’s top producers are Brazil, Uruguay and Madagascar. In Madagascar, amethyst tends to have a deep red tint. Brazil, where amethyst tends to be of a light violet color, produces ten times more amethyst than anywhere else in the world. 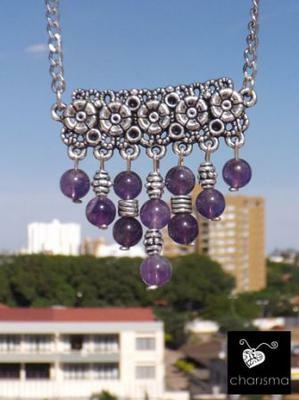 Uruguay is believed to have the most beautiful colors of amethyst. Bolivia also produces some amethyst, although Bolivia’s claim to fame stems from the discovery of a mine in the Eastern tropics of the State of Santa Cruz, in which amethyst and citrine have fused together to form a two-colored yellow-purple mineral, a geological occurrence so improbable, that this gem, now called ametrine, cannot be found anywhere else in the world. Because of this, ametrine is more often referred to as “bolivianite” or “bolivianita”. In addition to its ability to prevent intoxication, amethyst is believed to have many other special qualities. Amethyst is one of the oldest known gems. It was first discovered in Egypt as far back as 3100 BC. Cleopatra’s signet ring was made of amethyst. In ancient Europe, where it came to be known as the “bishop’s stone”, amethyst has been prized by members of high clergy and royalty. Those who are superstitious believe that amethyst imparts tranquility, and helps the wearer to gain understanding of new concepts, making them better businesspeople. 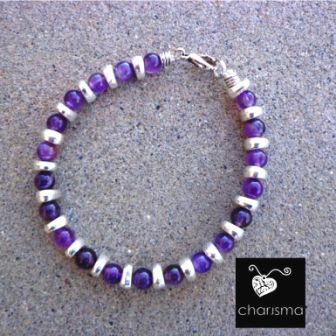 Others believe that amethyst can cure a number of ailments including arthritis, deafness, and heart disease. Amethyst is a February birthstone. 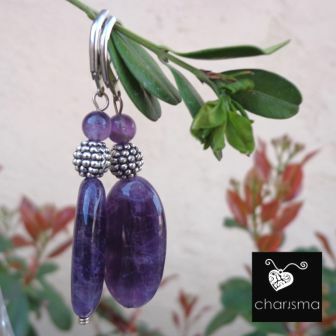 The Amethyst used in Charisma Bolivia jewelry is produced locally and imported into Bolivia from the neighboring countries of Uruguay and Brazil. 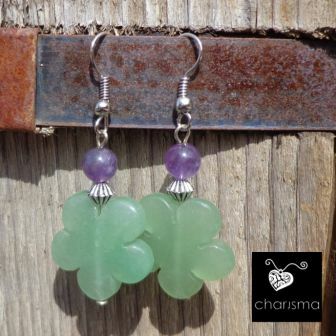 Charisma Bolivia jewelry is handcrafted by artisans in Santa Cruz, Bolivia. I then bring our collections back to the U.S.A. where I place them in our online store. All orders are mailed worldwide from California. I invite you to watch the slideshow below. Join in and write your own page! It's easy to do. How? Simply click here to return to Charisma.